As Robin Cembalist writes, “Lots of familiar names pop up in Jew York, the exuberant summer group show that opened at Zach Feuer and Untitled galleries last week.” And its true. Even the press release is chock-o-block with cheeky humor. UNTITLED and Zach Feuer invite you to join them as part of their summer long foray into the contemporary work of America's Jews in their natural habitats—the Lower East Side and Chelsea—and help make all of our mothers’ kvell. Shalom. What do I think of when I think New York Jews? I think of Jerry Seinfeld and Woody Allen. Even some of the work in the show reinforces the neurosis that we love so much. 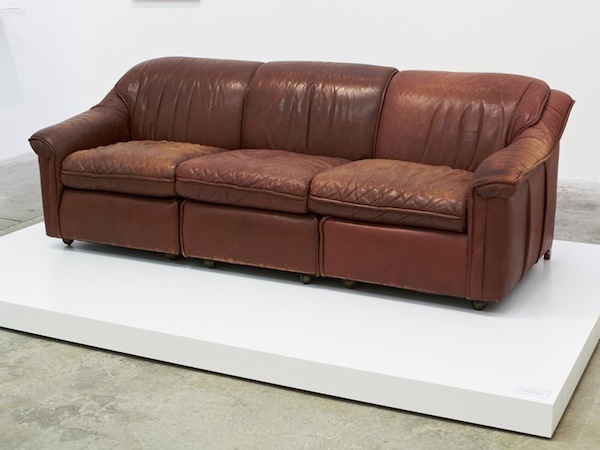 Take for example, Jennifer Rubell’s, My Shrink’s Couch 2012. This is not a European, turn of the century chaise that Freud analyzed his patients on. It’s a leather lounger - worn, comfortable and easily imagined on the set of That Seventies Show or even Annie Hall. That made me think that all the other work in the exhibition could have been made by one artistic Zelig, Woody Allen’s chameleon of a man who not only takes on the mannerisms of others but starts to look like them too.